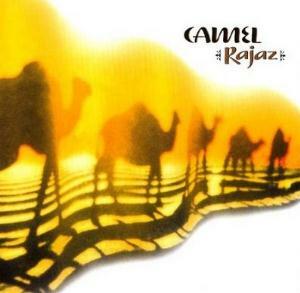 Rajaz brings a completely fresh sound never heard before in Camel's repertoire, adding eastern influences ala Roots to Branches by Jethro Tull, but Rajaz, as much is post-80's Camel, is much calmer and moody that may remind you to the mood of The Division Bell by Gilmour & Co, however Rajaz having a pretty high prog quotient compared to the lack of it in the aforementioned album. However, The Division Bell and Rajaz share another thing in common, that is the focus on the sentimental and energetic guitar, while the keyboards are not a key-role anymore in any of the two cases. Anyways, Rajaz, as I already said is also more focused in the Prog aspects. Already since the blasting drums of the intro song, you really can't stop the album running. The intro being really good, describing the moodier sound they are into. The instrumental tune changes of mood quite a few times, from the fast intro of the drums to the slightly keys and guitar effects. An interesting instrumental which makes a solid and intriguing opening to this album. Then comes Lost and Found. Here we have Andy's new voice, really soft and low-timbre, the voice maybe here is well recieved, not being bad as many say, neither fascinating, but fits the music, IMO perfect. The song changes of mood from softy passages to a more violent one, with the synths present. Here you can already feel the oriental influences. A well performed synth solo, with a good bass following it. Lovely how the music gentenly slows down with Andy's guitar. Lovely it is the final section. Then follows the Final Encore. Surely not a fave of mine, this one being too much influenced by oriental music. Not totally bad, but the oriental feel overall is ugly. Way too Egyptian... The keys sound too 80's and Andy's voice seems like from a mummy. After a dissapointing one, you can feel the gentle acoustic guitar from Andy correcting his mistake. Rajaz, being totally great, another song that full fills the album's unique carachter. Andy's voice is nice and moody, very dreamy. After a while you soon feel the bass beating as yor heart, and an echoed key sound is heard. Yeah there's where a short and gentle guitar solo comes and Andy's voice is somewhat more intense. The final solo is really relaxing, and really good. Then follows up Shout.. A simple song, really. Quite as a filler. Boring, nothing in it. A stupid moog in it, not doing nothing. Another mistake. They could have done a simple song but with the same atmosphere the album is trying to reach. Straight to my Heart has a similar guitar from Rajaz, being quite misleading but still the song flaws very good. Then seems like a slide guitar enters, and breaks the soft mood as the keys and bass did in Rajaz. Still being soft, there's more activity. In the middle part you listen a very Dire Straits solo, IMO. Very good. Could have been called Rajaz: part 2. Sahara. A masterpiece of a song, I should say. As I said the album tries to reach an atmosphere, well this song reaches it, as Rajaz and Lost and Found do as well. Somewhat jazzy the intro, very relaxing. Andy's guitar after a while it breaks the habit! Thunderous guitar it is. Masterful work. The drums and bass fill the rythm section very well. The guitar solo is very 90's I should say, as Gilmour's. Fascinating is when the keys slow up the music to an un-reached zone, and the oriental influences take lead on Andy's guitar in a great way, this time. The song continues with this masterful guitarist, reaching more and more to a greater solo from what it was at the begining. It finishes as it started. Reaching the end, we got a 10 min song, Lawrence...Good? Bad?... Begining somewhat like Lunar Sea, at cause of the keys, it then moves into a repetitive slow and boring pattern, in which the main focus is on Andy's exceptional, though a bit too long, guitar solo. As a 10 minutes song, you really can't expect that, I mean, the guitar solo is fantastic like always, but 10 minutes!? Great solo, bad song. This album ends up being a excellent return to their Prog roots, even if the mood and influences are quite different than from those from their 70's classics. Anyone who gave up Camel long ago, should check this and the following one out, they shouldn't dissapoint at all. One of the few 70's Prog bands, that still progress'.